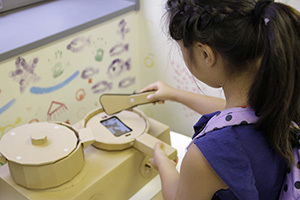 The smart toy kitchen allows children to experience fun cooking by inlaying smartphones into the cardboard kitchen set of frying pan, saucepan and cutting board. The app delivers a magical feel, allowing children to feel as though they are cooking in real life, with all the authentic sounds and the abstract cardboard toy. Rice grains jump out of the pan when you shake the frying pan, hot steam bursts out when you open the lid, and you can even cut the ingredients with the toy cutting knife. This is an app that was designed to use smartphone’s abilities to its full potential. Thank you for choosing ‘Danbokko Kitchen’ as Digital Ehon Award’s Grand Prize. Danbokko allows children to create their own story using their imagination. In order to spark children’s creativity, we made the best use of digital device, imitated a real cooking experience, and designed it to be expandable. We chose cardboards and made it 3 dimensional, allowing to feel the texture. We also drew the illustrations, trying to make it as original as possible. 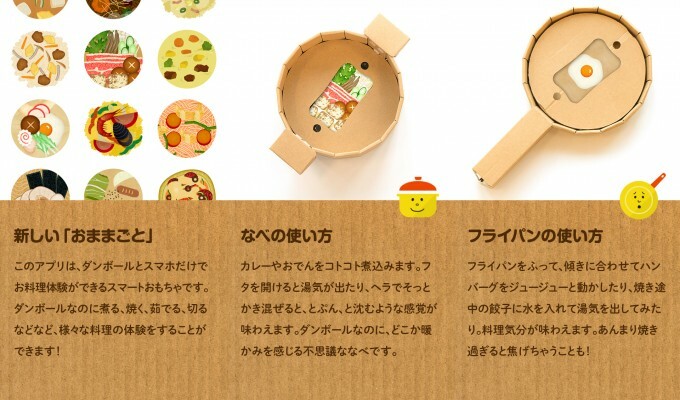 We were able to successfully execute this project with the collaboration of Kayac, who produced the app with the storyline, and Bando, who produced the safe cardboard toy. I hope the experience of children using their own imagination, rather than merely looking or hearing, will support the strength and smiles of the children in the new era.